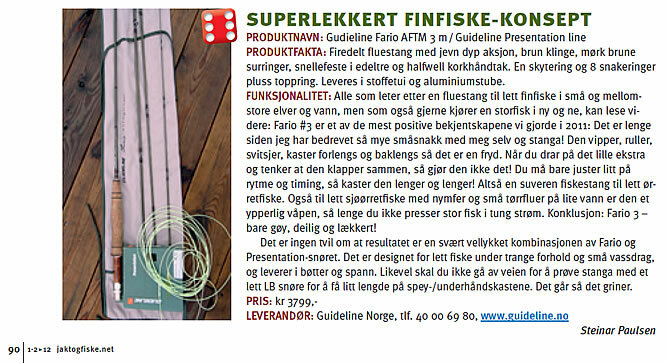 This is a test done by the largest outdoor magazine in Norway: Jakt & Fiske. The rod tested is a Fario 863 (they forgot to mention that). PRODUCT NAME: Guideline Fario AFTM 3 w/Guideline Presentation. PRODUCT FACTS: FourPiece flyrod with smooth deep action, brown blank, dark brown Whippings, reel mount with rosewood insert and half well cork grip. Guides: Shooting and 8 snake rings plus tip guide delivered in fabric case and aluminum tube. Fario # 3 is one of the most positive rods we tested in 2011: It’s a long time since I have felt such a bond with a fishing rod! Casting with Fario is a delight. When you push the rod to its limits and reach the point where you don’t think that it will go any further, it never lets you down! The nice thing about Fario is that small adjustments to your casting stroke will draw increasing levels of performance out of the rod! This is a premium rod for trout fishing in all aspects but it is best suited to the presentation of dry flies and nymphs, not smashing out heavy lures. Although having said this, I have used it for fishing in saltwater with small nymphs and dries after seatrout and it worked very well. As long as you are not fishing after really large trouts in heavy current this is a great tool. Fario 3 – a fun rod to fish with and an an exquisite performer. While Fario three is a super little rod to couple with any line, it literally excels with the Guideline Presentation fly line. This line is designed to turn over and load easily even when making off the water casts or ‘flicking’ in tight situations. It is arguable that the Fario and Presentation line are the very best team for making off the water and presentation casts off the water. If you want to cast longer don’t be afraid to put on a long belly line, it works nicely too.